Alcohol 101: How can I fit alcohol into my diet? Alcohol 101: How can alcohol fit into my diet? One of the common questions I receive in my practice is, how can alcohol fit into my diet? Honestly, as an RD I have nothing against alcohol. In fact, if you were to review many of my customized meal plans you would see I actually purposely put alcohol on my patient’s meal plans. While, I personally can count on one hand how many drinks I have in the course of a year it does not by any means make me a hater. Honestly, it seems like I did SOOOO much drinking before I turned 21 (many, many, many moons ago!) that when I finally did actually reach the legal drinking age – I was all set 🙂 SO I will cheer YOU on! However, as we all know calories in drinks can add up fast. And as a result, instead of seeing results, patients remain “stuck” in a weight loss plateau. Sound familiar? 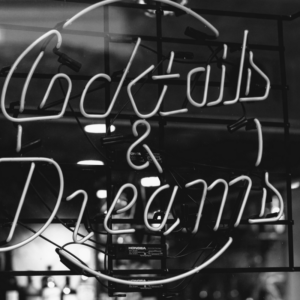 Since alcohol is a pretty much part of just about every social occasions including family parties and nights out with friends seems like it would be worth chatting about. Right? Whether you are trying to lose weight or build muscle, drinking alcohol too frequently can get in the away of your goals (shocker right?!). However, this does not mean you have to give up the occasional drink or night out with friends. Rather, just do so in moderation. And follow my tips for making the best choices when it comes to alcohol. Winner, winner, winner chicken dinner! First things first. Before we talk about how alcohol can fit into your diet we probably need to define an alcoholic drink. Most people are surprised to learn what counts as a standard drink. The amount of liquid in your glass doesn’t always match up to the alcohol content of your drink. Different types of beer, wine, and hard liquor can have different percentages of alcohol content. In the U.S., a standard drink contains roughly 0.6 fluid ounces or 14 grams of pure alcohol. What has more calories: beer, distilled spirits, or wine? • 1.5 ounce drink of distilled spirits (40 % alcohol) is 98 calories, 0 g CHO, 0 g Pro, and 0 g Fat. 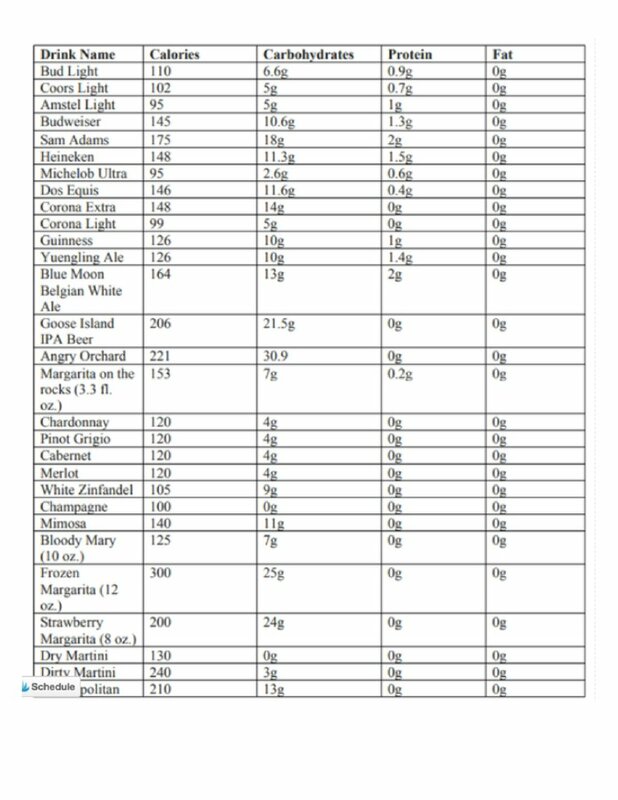 • 12 ounce drink of regular beer (5 % alcohol) is about 150 calories, 13 g CHO, 2 g Pro, 0 g Fat. • 5 ounce drink of wine (12 % alcohol) is about 120 calories, 4 g CHO, 0 g Pro, 0 g Fat. What are the current recommendations for alcohol? The Dietary Guidelines for Americans alcohol recommendations differ for men and women. 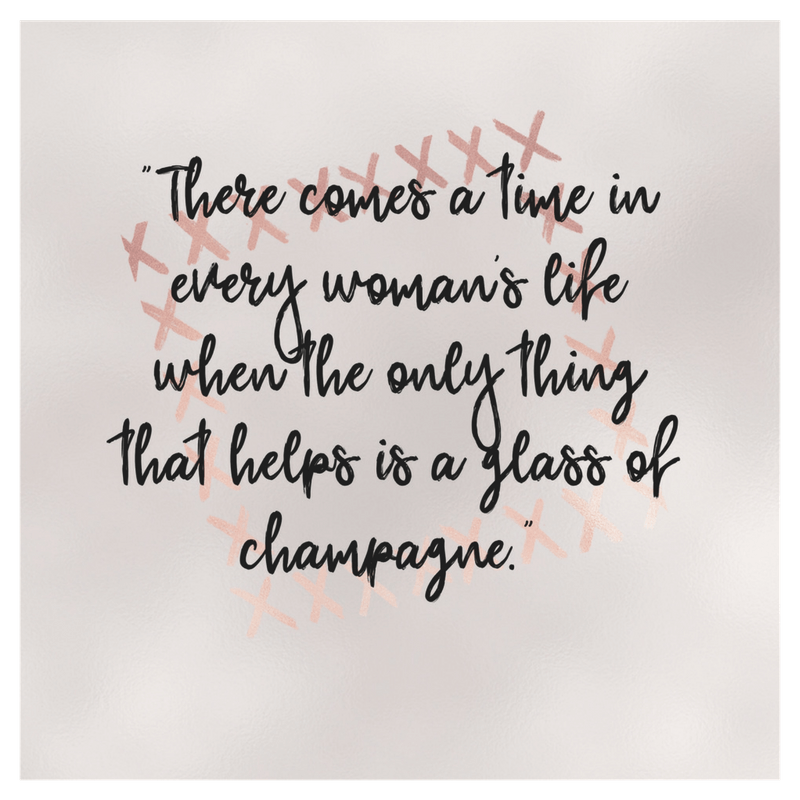 Women are encouraged to limit alcohol to up to 1 drink per day. While men have a slightly longer leash of up to 2 drinks per day. The Dietary Guidelines do not recommend that individuals who do not drink alcohol start drinking for any reason. Translation – there is no nutritional value to drinking. Therefore, no need to establish a “new” habit if you don’t already have one. Aint’ that the truth ?!? The Dietary Guidelines also warn about the side effects of excessive drinking. These include: binge drinking, heavy drinking, and any drinking by pregnant women or people under the age of 21. Binge drinking is defined as drinking more than 4 drinks during a single occasion for women and more than 5 drinks during a single occasion for men. Heavy drinking is defined as consuming 8 or more drinks per week for women and 15 or more drinks per week for men. 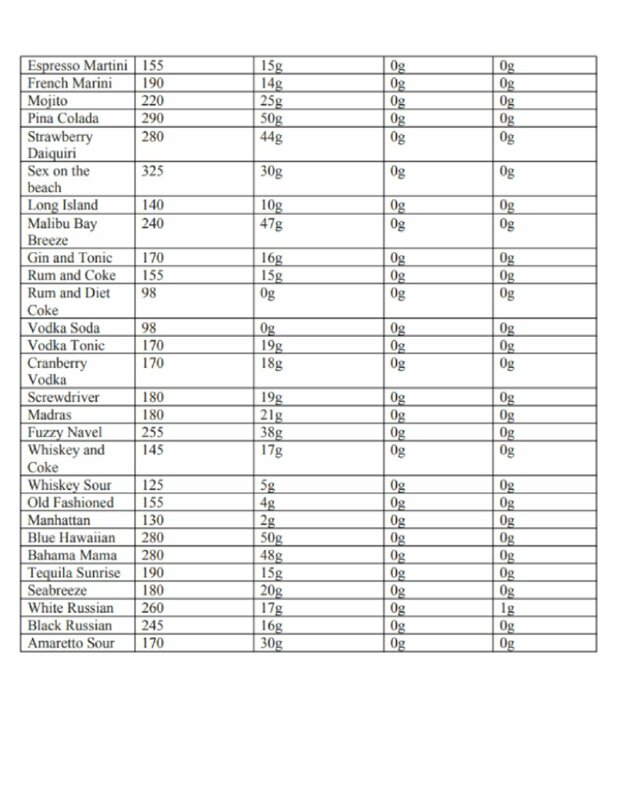 If you are confused, please see above to see what counts as a standard drink. Consequently, excessive alcohol use can lead to the development of chronic diseases and other serious problems. These may include hypertension, heart disease and stroke. Not to mention liver disease, digestive problems, cancer, learning and memory problems, mental health problems, social problems, and alcoholism. And how about them calories? What does my drink ‘cost’ me? I have done my best to establish a list of what I would consider commonly consumed alcoholic drinks. As mentioned previously, the calorie counts mentioned above are just for the alcohol. They do not address the multitude of beverages alcohol can be mixed with. My list below does include the mixers. The list is comprehensive but by no means all inclusive. Furthermore, don’t quote me on all the values – they are more or less estimates and refer to a standard drink. Depending upon who is making your drink – they may pour more or less alcohol and/or add more or less juice/soda/tonic/mix. If you do not find your drink of choice on this list, you can check out Calorie King for additional nutrition information. Now that you know the numbers – let’s get down to the basics. The addition of juices, sodas, and sugary syrups are a caloric and sugar force to be reckoned with. And just because your drink is “clear” does not by any means it is free of calories. There’s a common misconception that tonic water is the same as seltzer water, but it actually contains a lot of calories and sugar. Or some folks think because their drink is mixed with juice – it is a better choice. Most juices contain at least 110 calories and 25 grams of sugar per 8 ounce serving. So you add in a shot of alcohol and you are looking at + 220 calorie plus drink. While this may seem somewhat benign when you are on a calorie budget every calorie counts. Instead try herb infusions, flavored club soda, or a squeeze of citrus. And if you choose so, use diet soda instead of sodas laden with sugar. Below are examples of low calorie mixers. Or you can even skip the mixer altogether. Try ordering your favorite spirit or one of the new flavored liquors on the rocks (translation just on ice). Infused and ‘flavored’ vodkas are very popular because they are not sweetened but infused with flavor. There are a whole host of flavors ranging from jalapeno to peach to blueberry, to lechee fruit. You name it – there is probably an infused liquor with your favorite flavor. And best of all the flavor exists without adding any extra calories. The alcohol itself has calories (9 calories/gram) but you are saving on the calories from the mixer without compromising taste. One of my favorite things to do (for the handful of drinks I have per year) is to make my own infused tequila. I take a whole pineapple and slice it into small disks. Next, I take about 4-5 jalapenos – seeds and all and chop them up. I then put the sliced pineapple and peppers into a tall glass pitcher. Next, I pour 2-3 cups of tequila over the fruit and peppers. I cover the mixture let it sit for about 4-5 days. Each day I muddle the mixture with a wooden spoon to release the juices and oils. Once the mixture is good and spicy I strain the liquid through a fine sieve and throw out the fruit and peppers. Lastly, I refrigerate the tequila until I am ready to use it for spicy margaritas! Yum! Sounds pretty fancy, right? If you just want to be social and club soda won’t cut it with the company you’re keeping, ask for a wine spritzer, heavy on the spritz. All this is wine mixed with club soda. If you want to get extra fancy you can even try some of the zero calorie flavored seltzers to pump up the flavor. You knew this was coming. Alcohol is a diuretic. Replacing fluid, particularly in warmer climates (hello Caribbean vaca), is essential. Calories (and sugar!) aside, try to make every other drink either club soda, sparkling water, or just plain water. Adding ice cubes to your beverage will help hydrate you and also make your glass of booze feel bigger. The best way to prevent alcohol from derailing your diet is to avoid drinking altogether. Why not volunteer to be the DD (designated driver) and save your group taxi or Uber costs by offering to drive? While it may not be as fun as indulging with your group, you’re the one who’ll wake up the next day without a food or alcohol hangover. And as we all know that feels pretty dang good. Bottom line – If you budget your calories carefully, you can safely “afford” to have a drink or two on a special occasion. But drinker be ware. Drinking loosens your inhibitions and may prompt unconscious eating. Additionally, drinking alcohol can also make you feel hungrier because alcohol can lower your blood sugar. SO why not grab a quick bite before you imbibe? Some good pre-party noshes: a small meal or snack containing fiber, protein and healthy fat. These might include a low-sodium chicken soup, greek yogurt and fruit, low-fat cheese and whole-wheat crackers, or a handful of nuts.Therefore, from a health standpoint, calories aren’t the only thing to consider. Practice moderation and always, always, always have a designated driver. Heck call me – and I will come get you!